The bundle also includes a matching Dualshock 4 Wireless Controller, and the standard edition of Call of Duty: WWII. Customers who buy the limited edition bundle will receive codes for Call of Duty: WWII’s “Divisions”, “Nazi Zombies” and “Weapon Unlock Token” DLC packs and a full game download voucher for Sony’s party game That’s You! 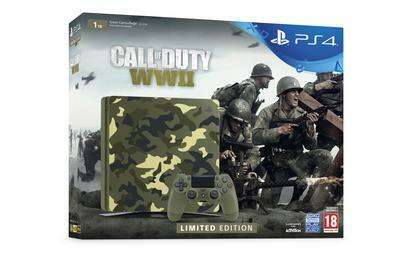 The Limited Edition Call of Duty: WWII Green Camouflage PS4 bundle will be available from select retailers with a recommended retail price of AUD $549.95. A second bundle, comprised of a Jet Black 1TB PS4 Pro and Call of Duty: WWII, will also be available from launch. However, local pricing for that bundle is still TBC. Call of Duty: WWII will be available on PC, PS4 and Xbox One when it releases on the 3rd of November.